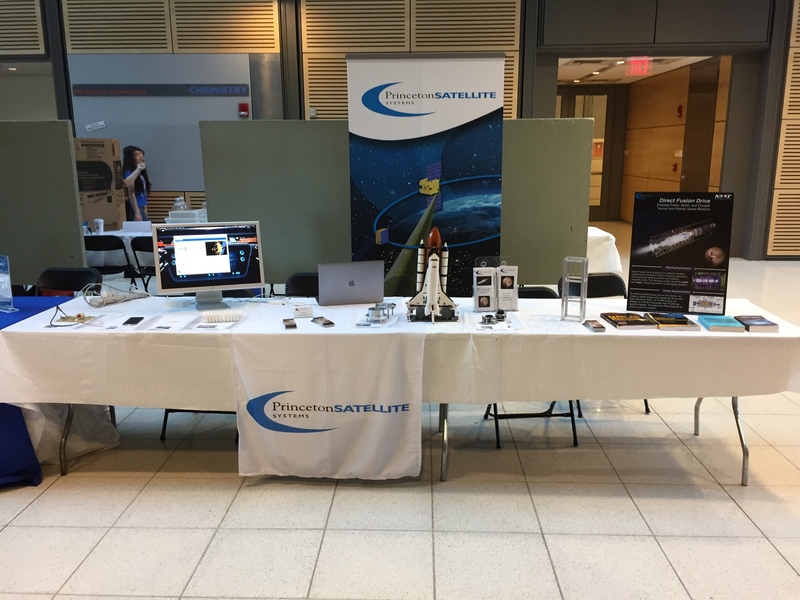 Princeton Satellite Systems attended the Young Women’s Conference in STEM in at the Frick Laboratory on the Princeton University campus again this year. We had an exhibit with spacecraft hardware and software. This include 3D printed models of our fusion reactor core and a 2 stage to orbit launch vehicle, star and navigation cameras, a circuit board for driving a fusion reactor and a 3U CubeSat frame . We were also running a simulation of a Lunar Landing simulation. We met many enthusiastic students this year! It seemed that there were more high school students than in past years. A budding plasma physicist asked how we fuel the Direct Fusion Drive engine. Another student, looking at our Lunar Lander simulation display, asked what is a quaternion! The disassembled reaction wheel was very popular. Some students wanted a detailed explanation about how the motor worked. One student wanted to know the electrical details of our RF board. Several were interested in our Army iPhone app. One wanted to know if she could get it from the App Store. Other attendees included Lockheed Martin, the FBI and the Princeton Plasma Physics Laboratory. Click on this image to see a video about the event. It was a fun event, albeit exhausting given the four hours of continuous conversations. We do hope that we inspired some of the attendees to pursue careers in science, math and engineering! Mike Paluszek gave a talk on the Pluto Orbiter mission to the Rutgers Engineering Honors Council Keynote Speaker Event on March 22, 2016. The talk covered the mission and spacecraft and outlined the design process. Mike also discussed engineering careers and how to make the most of one’s own career. This is a photo of the group. A photo of Mike with the officers.